Easter is a big day for Gwen Stefani and Blake Shelton and her three sons. First the group went to church together and afterward they stopped off at Ralph’s supermarket on La Brea (our neighborhood!) to pick up some snacks -cheese, drinks etc. (Our spy says they shopped like a married couple) Armed with treats, the family plus one, arrived at the home of Gwen’s parents for holiday dinner. Blake really seems to get along with Gwen’s sons. 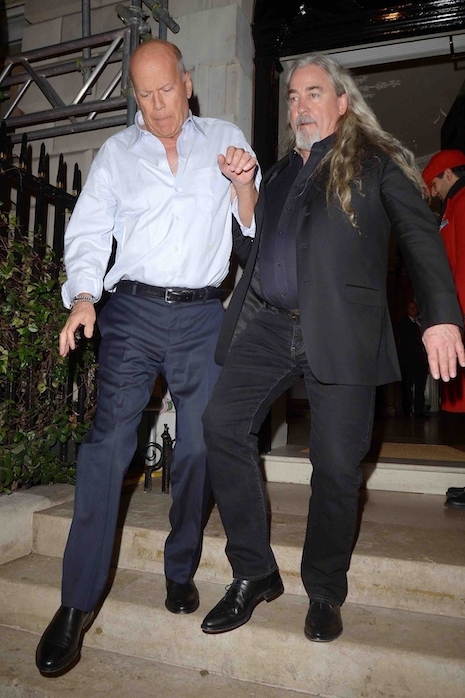 We have to admit we got a laugh out of seeing an intoxicated Bruce Willis being helped out of Annabel’s in London and plopped into his ride by two doormen. At second thought, maybe it’s NOT that funny. Bruce, a former bartender, has been mostly on the wagon in recovery for years, until not long ago when he admitted that he indulged in “a little wine” occasionally. Oops. It so happens that all three of his daughters have also been in recovery, so the desire NOT to drink runs in the family. You don’t often get to see Woody Harrelson looking like a happy family man – maybe because he lives in Maui and there aren’t so many paparazzi. 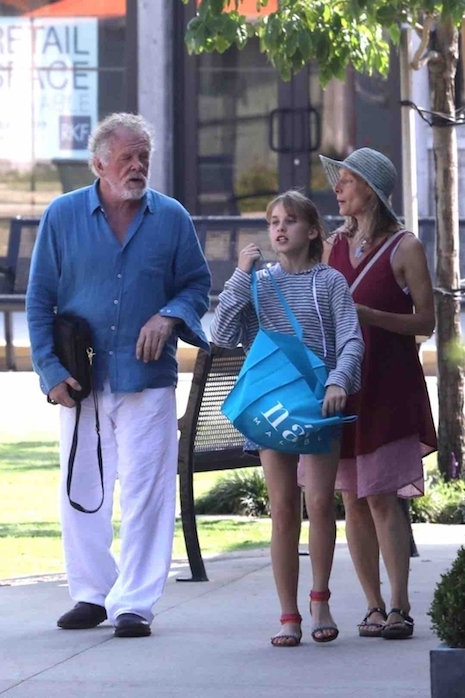 But this week he was visiting the Amalfi Coast in Italy with his wife Laura and his excited 12 year old daughter Makani. Laura was his personal assistant before they married in 2008. They have two other daughters – Deni, 25 and Zoe, 21, not along for the trip. He was Oscar nominated for “Three Billboards,” but Woody’s next film is Marvel’s Venom with Tom Hardy and Michelle Williams, coming in October. 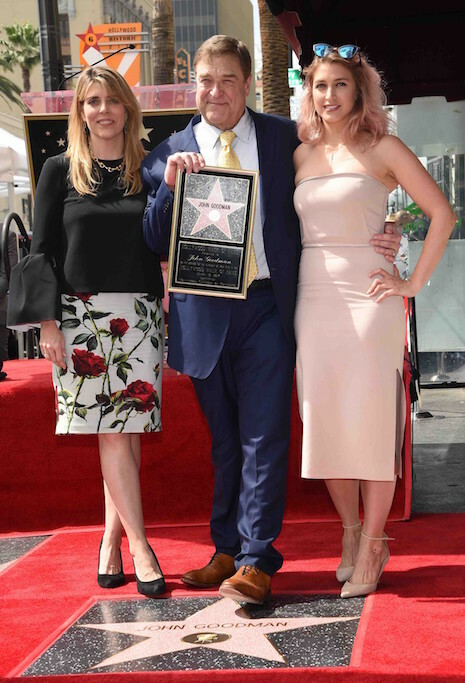 We don’t often see John Goodman, 64, and his family because they live in New Orleans, but they all turned up for his Walk of Fame ceremony this week. Goodman is a lucky guy – he’s been married since 1989 and his long-suffering wife Annabeth has put up with a LOT. John has had a major problem with alcohol over the years and he finally got sober in 2007. And of course, he also has a problem with FOOD and has weighed up to 400 lbs! He seems to have his life in control now, and he helped his daughter Molly find work as a Production Assistant. We LOVED John in last year’s 10 Cloverfield Lane. James Corden, 38, and his wife Julia dropped off their impossibly cute kids at school together. His Late Late Show started with low expectations, but now he’s being hailed as the new King of Late Night TV thanks to his Carpool Karoake videos. Corden’s songfest with Adele in his car was the most watched video on YouTube in 2016. He proved that TV ratings aren’t everything. 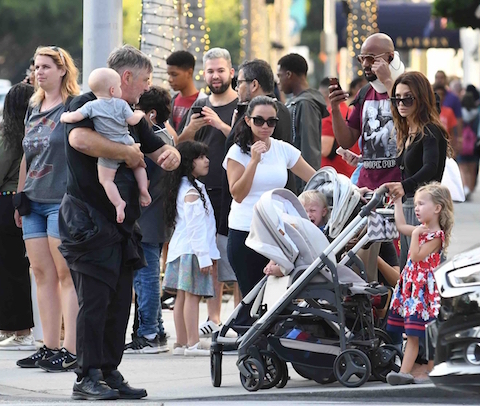 After James dropped off Max, 6, and Carey, 2, at school in Brentwood, he and Julia drove away in his black Aston Martin convertible. This Brit is livin’ the LA life….